Deep fried goodness of flatbread made with spelt and whole wheat flour and a generous sprinkle of dried fenugreek leaves, these Spelt Methi Pooris are an indulgence that makes you feel less guilty and something you definitely deserve on those cold winter days! 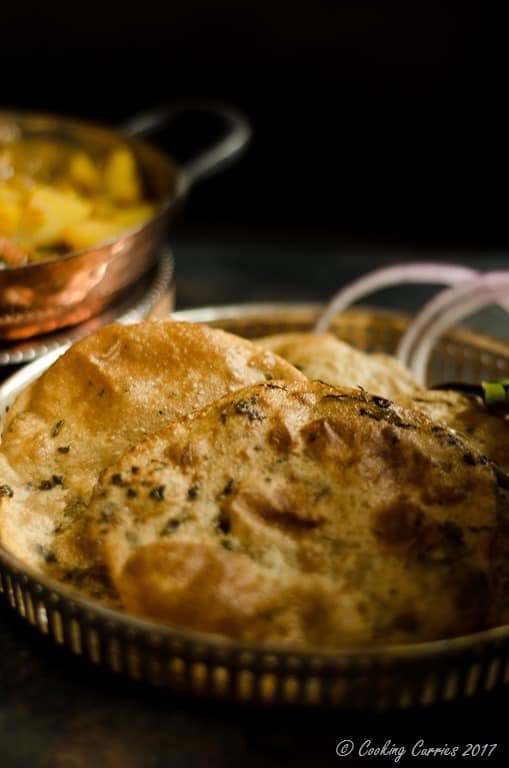 Pooris are essentially deep fried flatbreads that puff up to form gorgeous golden spheres! They are then dunk into potato curry – either a plain potato curry with onions and green chillies in it or a tomato onion potato curry or chole – a garbanzo bean curry, and devoured. 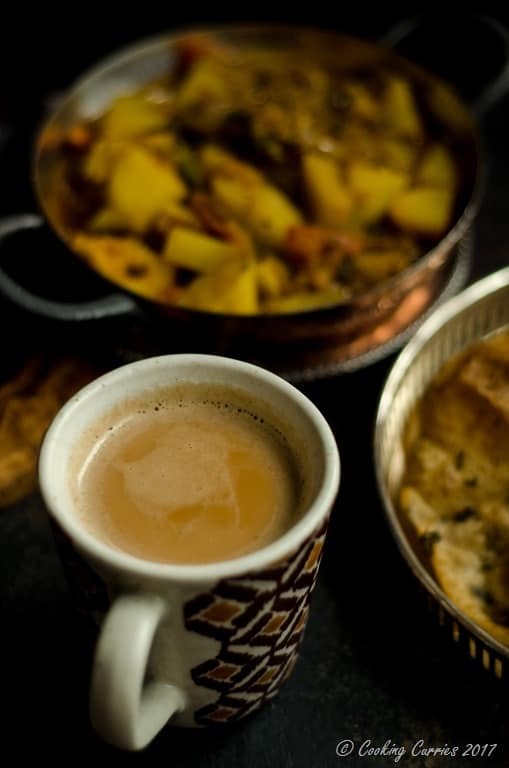 A nice steaming hot cup of chai on the side completes the picture of a perfect breakfast! Growing up, Pooris were always a Sunday affair. 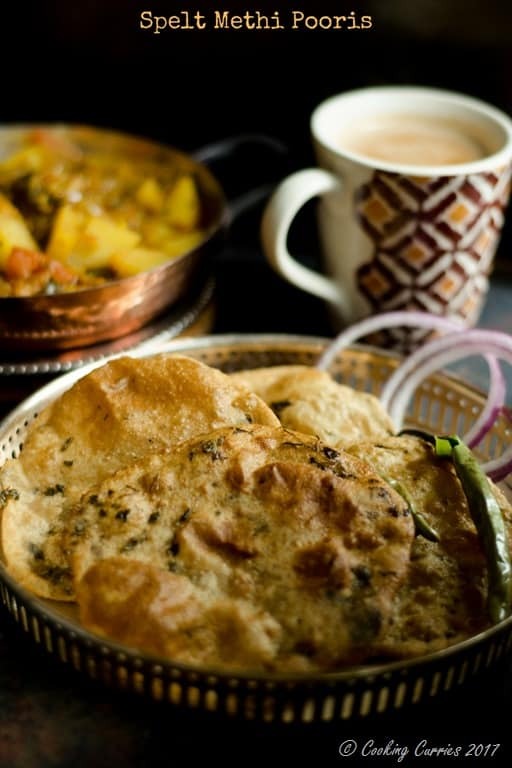 Most all Sundays, Amma made pooris and even though it was the same old regular poori with potato curry, we would always look forward to that breakfast. Pooris are usually made with just whole wheat flour or Atta, but in the last few years, I have started experimenting with and trying to add more ancient whole grains to our diet and I have had quite a good success with substituting part of Atta in pooris with spelt flour. Spelt flour has gluten in it, so it does not change the texture of the pooris or have any difficulty working with the dough. Spelt flour does have more vitamins, specifically B-vitamins, minerals (iron and manganese) and more fiber than regular whole wheat flour. Its also got a nuttier taste to it. If for some reason, you have difficulty digesting wheat, spelt flour can be a good alternative as it is more water soluble than wheat so digests easily as well. It however contains gluten so it wont work for you if you have Celiac disease or any other form of gluten intolerance. 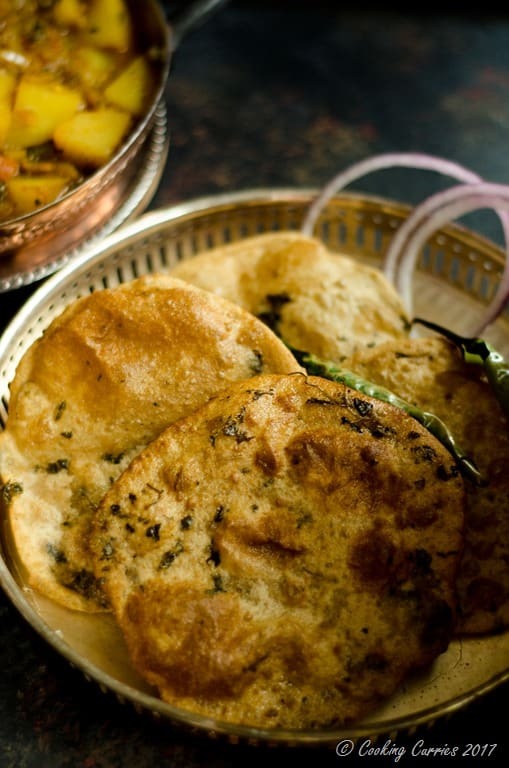 So, let go on and see how to make these spelt methi pooris! Add the whole wheat flour, spelt flour, salt, ajwain and kasuri methi to a mixing bowl. I use my Kitchen Aid stand mixer for this and use the dough hook. Some use a food processor. You can use your hands to mix as well. Add the water, a little by little, mixing the flours well, till they all just about come together to a soft dough. You may not need all the water, depending on the flour you are using and the amount of water it absorbs. The test for the atta or dough is so that it is smooth and soft all over but not sticky. If you do end up adding more water than needed and the dough becomes sticky, add more flour.